If you’ve ever wanted to speed without the risk of a hefty ticket, there’s plenty of companies out there willing to let you put the pedal to the metal on an authentic racetrack. However, it isn’t exactly cheap and, if you’re going to shell out the money to give it a shot, you should probably know what you’re getting into. 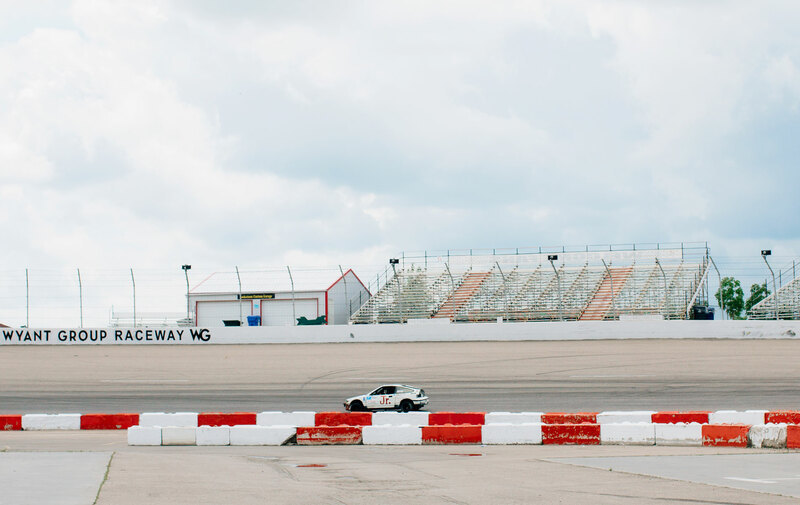 Cue Colleen Nicholson, who took to the Wyant Group Raceway in Saskatoon for a little joyride. The air was thick, and clouds hung over us at Wyant Group Raceway. My borrowed racing suit, full-face helmet and elaborate seatbelt harness combined in a “how bread must feel in a toaster” way, but it was decidedly comforting to be strapped in nice and tight as the wheels squealed and the car hugged turns. I gave the thumbs up to kick it up a notch. These first 10 laps were a demonstration. After the G-force had rendered my hearty brunch regrettable, I would get the opportunity to slide behind the wheel to drive another 10. We glided through a set of corners with a sweeping arc from the widest point of the lane to the tightest apex of the curve, the car tilting and pulling in seemingly impossible degrees. I swivelled my head as much as the HANS device and harness would let me and studied our lane position like I was cramming for a test (I was). Uncomfortably-close-to-that-pylon to that-can’t-be-safe edge-of-the-pavement and repeat. It was an extreme version of the lines I’d follow when I drove my bike. Minus the speed. Minus the jaw clenching. On our next lap however, the pattern changed. The car lurched and fish-tailed. Shawn corrected the steering two or three times to keep it in line. I stopped making notes about when to accelerate and started thinking about all the things I hadn’t done yet … in life. The interior of these mini stocks are stripped to the essentials; there’s no stereo, no floor mats, no speedometers and certainly no holy-hell handles. Bereft of this universal sign for I’m-mentally-dialing-1-800-Hows-My-Driving” my fingers found the edge of the seat instead, and I held on. As proud as I am stubborn, I wasn’t going to tap his arm (the agreed-upon red flag for “I’m done. This is too fast”) but I didn’t need to –he slowed on the straightaway and called out over the engine “Wheels are too hot!” On the next lap, at reduced acceleration, the car’s back end still felt eerily disconnected. Again, Shawn corrected in the turn and, then, as he straightened out, he dropped our speed to a disappointing crawl. We limped back to the centre of the track. Shawn waved the crew over and shouted out the window “Something’s wrong” as he twisted the key in the ignition. With renewed consciousness of the sauna-like heat generated by the I’m-a-giant-racing-rectangle jumpsuit, I yanked the release bar on the five-point harness and, with all the grace of someone who hasn’t watched a full episode of The Dukes of Hazard, pulled myself out through the car window and into the gasoline-perfumed air. One of the volunteer mechanics jacked up the car while another spritzed the rads to cool it down. I watched from a comfortable perch on the concrete half-wall. This pit stop would be the car’s last, at least for now. The panhard bar was broken, and the suspension would need to be overhauled. The Wyant Group Racetrack retires about one car a year; after a while, they’ve been driven so hard they can’t be patched up again. The other stock car on the track that day, a sweet mid-’80s Chevy Impala Thunderstock that I’d been eyeing was already in use, and I was running late to catch a flight home. (Admittedly, my crush on the Chevy was compounded due to the fluorescent “7” painted on its door. The now mortally wounded Ministock Honda CRX had a inarguably wussy, typographically inferior “Jr.” decal. If you’re going to reenact a thrilling one-sided chase scene, all the better to have a lucky number between you and the pavement, I say.) In any case, it was becoming clear that my chance to get behind the wheel had gone out the window with me. Secretly relieved that I wouldn’t have to demonstrate whether I remembered how to use a car’s clutch (I deeply suspect I don’t) in front of some of the best drivers in the province, I was also crushed to miss out on the chance to fully experience racing. On Wyant Group’s Street Car Test Drive days, they host individuals with certified helmets to time-challenge their daily drivers on the track. “We’re not taking these with us,” Magee said as he pulled a bag of golf clubs out of the trunk. With a smile and unnervingly casual “I haven’t driven this on here yet” quip, we hopped into Shawn’s city car, and he gave it a half dozen spins on the oval at high speed. This proved to be more fun and far more incentivizing to update my will than the stockcars. The lines he traced were tight and steady, but I would have traded the padded seats and stereo for the roll cage and window netting in a rapid heartbeat. 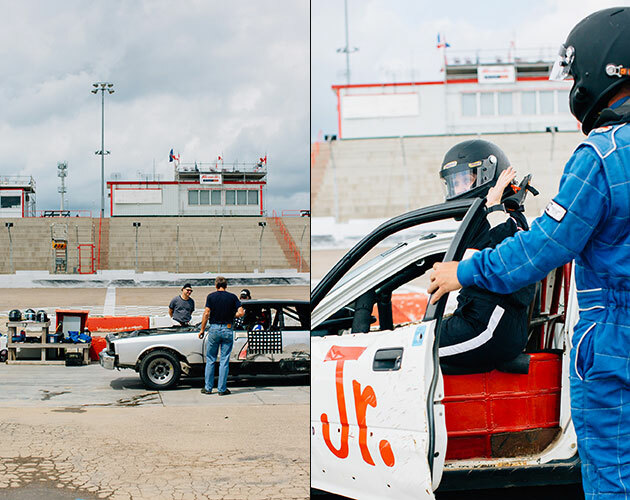 Shawn Magee has been racing all kinds of vehicles, two- and four-wheeled, since he was 13, and has placed in the gruelling Chumpcar Canada 24-hour endurance race, so, reassuringly, my raised eyebrows were the only ones in the car. And although tears were squeezed out of the corners of my eyes from the G-force, I couldn’t help but grin, too. 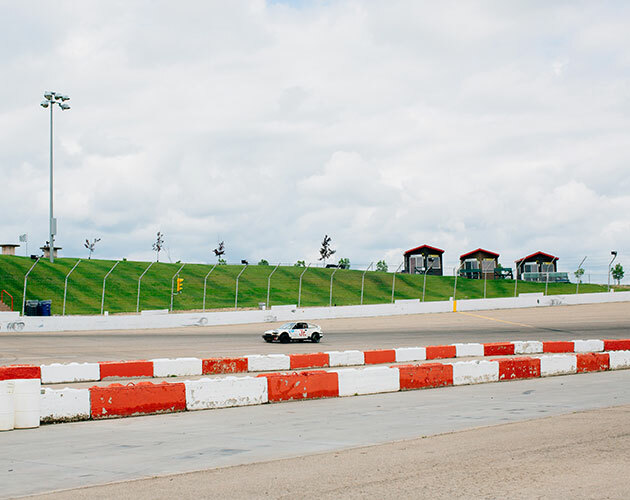 If you want to legally test your car’s abilities or get behind the removable wheel of a stock car, the member-run and volunteer-supported Wyant Group Raceway in Saskatoon sets aside a few days each season for the public to let their lead foot loose on their 3/8-mile paved oval. In the rest of Canada, Rusty Wallace Racing Experience (racewithrusty.com) provides ride-along and drive experiences on speedways from British Columbia to Prince Edward Island (starts at $149 for 3 laps).